By Jay Rogers. Posted October 25, 2017. A topographical map of the Mount of Olives. Click to enlarge. The following is part 3 of an excerpt from my soon-to-be-published book, In the Days of These Kings: The Prophecy of Daniel in Preterist Perspective. In the book I discuss the prophecy of Zechariah as “bridge” material between Daniel and the New Testament. All apocalyptic passages in the Bible have a “telescoping” characteristic. That is, we see a Final Judgment at the end of history projected onto events that were contemporaneous with the prophets, the same way that a telescope draws in far off objects and magnifies them up close. So in the destruction of Jerusalem in AD 70, there was the “end of the age” for Jewish Temple worship, but we are also pointed to the end of the world, when all false religions and vain philosophies will be finally vanquished at the return of Christ. Acts 1:9-12 states that the ascension of Jesus took place on the “mount called Olivet.” After the ascension, two angels announced, “Men of Galilee, why do you stand gazing up into heaven? This same Jesus, who was taken up from you into heaven, will so come in like manner as you saw Him go into heaven” (1:11). The Mount of Olives is the area in sight of the village of Bethany. After Jesus’ ascension into heaven, the Apostles “returned to Jerusalem from the mount called Olivet, which is near Jerusalem, a Sabbath day’s journey” (1:12). A Sabbath day’s journey is about a half mile according to most Bible commentators. So from the Mount of Olives, which is at a higher elevation, Jesus’ Apostles had a bird’s eye view of Jerusalem and could even see into the Temple courts from their vantage point. From AD 67 to 68, Vespasian commanded the Roman legions to the north of Jerusalem. When he learned of the death of Nero, he was persuaded to take most of his legions and march on Rome. He left his son Titus in command of the military forces. When Titus began to position his forces around the city of Jerusalem in 69, he called the tenth legion from Jericho to come up to the Mount of Olives and take their position there. … and as these were now beginning to build, the tenth legion, who came through Jericho, was already come to the place, where a certain party of armed men had formerly lain, to guard that pass into the city, and had been taken before by Vespasian. These legions had orders to encamp at the distance of three-quarters of a mile from Jerusalem, at the mount called the Mount of Olives, which lies opposite the city on the east side, and is parted from it by a deep valley, interposed between them, which is named Kidron (Josephus, Jewish Wars 5:69-70, emphasis mine). 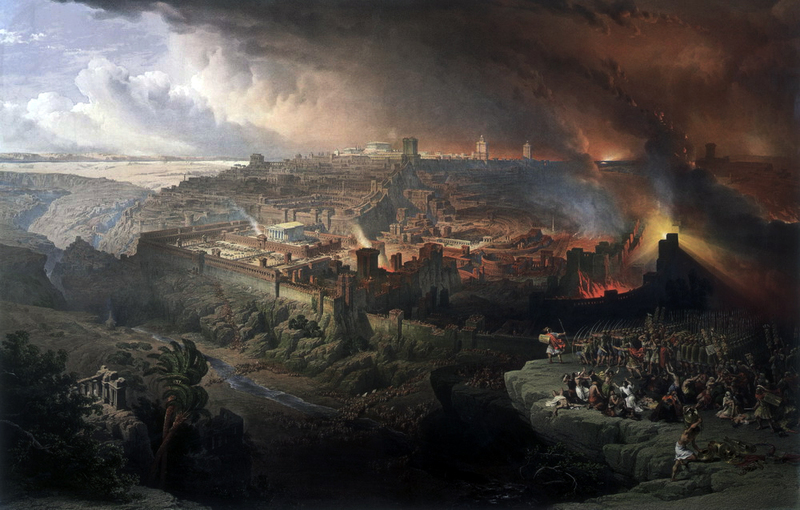 Siege and Destruction of Jerusalem by David Roberts – The painting shows the vantage point from atop of Mount Olives that both Jesus and the Roman troops had of the city of Jerusalem and the Temple. Click to enlarge. I do not subscribe to the hyper-preterist teaching that the Second Coming of Jesus occurred in AD 70. To the contrary, there is a prefiguring of the Second Coming in these cataclysmic judgments predicted by biblical prophecy. Zechariah 14:1-7 is primarily a prophecy predicting the siege of Jerusalem and the destruction of the Temple in AD 70. There is first the natural and then the spiritual. First, God defeated His adulterous Bride, earthly Jerusalem. Then He began to war against the heathen enemies of His true Bride, the heavenly Jerusalem. The spiritual warfare that is accomplishing this is ongoing. It began in the first century and it continues to the end. The warfare spoken of in Zechariah 14:1,2 is about physical warfare and the destruction of physical Jerusalem. Then the warfare of Zechariah 14:3-7 is about spiritual warfare in which the Lord himself fights for spiritual Jerusalem, His Bride, the Church. The Book of Revelation is then alluding to Zechariah and many other Old Testament passages as it is the capstone of all biblical prophecy. Before we can understand the Book of Revelation properly, we must first know Old Testament prophecy well. The Book of Revelation is one of the most densely hyperlinked books in the Bible, with each verse echoing, referencing, or alluding to an average of 2.44 verses in other books. Like any good index to an entire book – or in this case, a small library of books – Revelation awaits us at the end of the story. The problem is that so many modern commentators have studied Revelation in isolation, with the newspaper in one hand and the Bible in the other. This is the wrong approach. Instead we ought to look first at similar language in Old Testament books such as Daniel and Zechariah. Didymus the Blind (c. AD 313 to 398) was the leader of the famous Christian school of Alexandria for about fifty years. Despite his impaired vision, his memory was so powerful that he mastered dialectics and geometry. Didymus wrote theological works and completed commentaries on most books of the Bible. These survive in fragments only. Didymus wrote a commentary on Matthew, but it also has been lost. So we don’t know how he interpreted the Mount Olivet Discourse. However, an almost complete manuscript of his commentary on Zechariah was discovered in 1941, which has only eight of over 400 pages missing. He interprets Zechariah to be partially futurist, partially preterist and partially idealist. He relates some of the events prophesied in Zechariah 12,13,14 to first century events also prophesied in the Mount Olivet Discourse. Below is a lengthy quote showing that Didymus applied Zechariah 12:1-3 as having a literal fulfillment in AD 70 as a consequence of the Jews rejection of Jesus Christ. An oracle of the word of the Lord on Israel. Thus says the Lord, who stretches out heaven, lays the foundation of earth, and forms a spirit of a human being in it: Lo, I am making Jerusalem like a shaken threshold for all the peoples round about and in Judah; there will be a siege against Jerusalem. On that day I shall make Jerusalem a stone trodden on by all the nations; everyone who treads on it will mockingly mock it, and all the nations of the earth will gather against it (Zechariah 12:1-3). The prophet Zechariah prophesies the fate of Judah and Jerusalem and its inhabitants after the crucifixion of Jesus, receiving his message from the creator of everything…. The one “who stretches out heaven, lays the foundation of earth, and forms the spirit of the human being in it” threatens to devastate and destroy the city and region of the Jews on account of the crimes committed by those guilty of godless deeds against the savior who has come. They inflicted cross and scourging, remember, on the one who gave his life as a ransom, removing the sin of the world – and this despite his coming for the salvation of all (Matthew 20:28; John 1:29). Now, what is the awful fate he forecasts for the Christkillers? “Lo, I am making Jerusalem like a shaken threshold and Judah for all the peoples round about” so that they will no longer have a basis and security because they will be abandoned by the one who laid its foundation and protects it. The prophecy of Isaiah made in the manner of a threat is fulfilled, “Daughter Sion will be abandoned” (Isaiah 1:8), and in Jeremiah by the one who rejects it on account of its bouts of impiety in the words, “I abandoned my house, I dismissed my inheritance, I surrendered my beloved soul into the hands of its foes” (Jeremiah 12:7). Before the abandonment and surrender, remember, the city to which this refers was a house and inheritance and beloved soul; but later he said of it because of its impiety towards him, “Lo, your house is left to you in ruins” (Matthew 23:38). Now, it is right that the threshold and not the doors will be affected: it is not the complete security that is undermined — only what is in shadow and the letter, which is an introduction to the externals of the Law, referred to as “regulations for the flesh imposed until the time comes to set things right” (Hebrews 9:10). The awful fate that was threatened befell both the material Judah and its capital, which in fact was destroyed to the point that there was no longer “stone standing on stone” (Matthew 24:2). So the neighboring peoples of foreign nations, who were not allowed to enter and set foot on the sacred floor, will trample upon it in the way a common and ordinary stone is trampled on when people walk on it with unwashed feet. Contemplating this harsh plight with prophetic gaze from a distance, weeping and wailing over the city that had fallen foul of such misfortune, Jeremiah exclaimed mournfully, “How lonely sits the city that was thronged with people! She is reckoned as a widow, once the most populous city among the nations!” (Lamentations 1:1). On approaching Jerusalem the savior had said this would happen to her: “Jerusalem, Jerusalem, if even you had only recognized the things that make for peace. But now they are hidden from your eyes: your enemies will come upon you, surround you, and throw a rampart around you” (Luke 13:34; 19:42,43), so that you will be abandoned and dashed to the ground, with all the hostile nations encircling you, and so you will be seen to be desolate. “When you see Jerusalem surrounded by armies,” Scripture says, remember, “you will know that its devastation has come near” (Luke 21:20). The killers of the Lord had actual experience of this when the Romans overpowered them, destroyed their cities, and enslaved them; they were taken off into captivity or, rather, uprooted from their motherland, and so no longer had their own land or country, but were taken to every quarter of the earth. In reference to the wrath that had at last befallen Judah and its inhabitants, an historian, one individual from those who actually experienced it, wrote an account in many volumes of them and their places, so that the fulfillment is indisputably visible both of what the Savior said and of what Zechariah uttered in prophetic mode, beginning with the verse “I am making Jerusalem like a shaken threshold.” When the threshold was reduced to shaking and the city subjected to a siege, all the foreign nations scornfully entered and trampled on it like an unclean stone, no longer approaching it as a shrine and sacred surface, showing no respect or performance of due rites of expiation and purification. Hence they “mockingly mocked it” like a ruin, with everyone from that time coming to it to “plough it like a field” (Jeremiah 26:18). Commenting on Zechariah 14:1-2, Didymus first gives prior examples of judgment prophecies from Israel’s past, which referred to the Assyrian dispersion of Israel and the Babylonian captivity of Judah in the eighth and sixth centuries BC. Then he applies verses 1-2 directly to the Roman-Jewish War and the destruction of the Temple and the city of Jerusalem. Thus Didymus shows that he understands the role of Zechariah in providing the bridge between the Babylonian captivity and a yet-to-come judgment on the nation of Judea in AD 70. Lo, days of the lord are coming, when your plunder will be divided in your midst. I shall assemble all the nations against Jerusalem to battle; the city will be taken, the houses ransacked, and the women defiled; half of the city will go off in captivity, but the remainder of my people will not perish from the city (Zechariah 14:1,2). It was noted above as well that a Jewish historian, Josephus by name, truthfully and precisely described the disasters befalling the nation, including starvation and other misfortunes much worse than that; the searcher after good can meditate on it if interested in reading directed to learning and the fear of experiencing the same fate. The text says that the survivors were not snatched away from the city by the cruel tyrants; they were those whom God tests by fire, as he proves silver and gold so as to bring to light their glory and honor (Didymus the Blind, Commentary on Zechariah). Is there such a thing as “replacement theology”? Dispensationalists often accuse those who see unity in the Covenant of God of teaching “replacement theology.” In short, this is a straw man argument based on a misnomer. Covenantal theology teaches there is only one Covenant renewed again and again throughout Scripture between God and His people. The Book of Hebrews in particular reveals that salvation has always been through faith in the atoning work of Jesus Christ from the time of Abel through Abraham, from Moses through the time of the prophets, until the time of the New Testament (cf. Hebrews 11). The charge of “replacement theology” can only be made when a dispensationalist paradigm is assumed. Since there is only one people of God and one Covenant, Israel is the Church and the Church is Israel. There is nothing to “replace.” So-called difficult passages, such as Daniel 12:1, may confuse the modern reader. Daniel 11 covers Judea’s history prior to Christ – then Daniel 12 shifts abruptly to the destruction of the Temple in AD 70. This is only a problem if we assume that a prophet of the sixth century BC would make a strict separation between the Israel and the Church. Every one who is found written in the book” (Daniel 12:1). We must interpret this to include the first century Jewish Christians who were the “new Israel” living in Judea, even while God was judging the disobedient element among the ethnic Jews. Likewise, when Haggai speaks of a shaking of the heavens and the earth (Haggai 2:6), he is speaking of a winnowing of the people of God so that only the true seed of Christ will remain. When Zechariah seems to jumble up the history of Judea with messianic prophecy and the separation of a faithful remnant (cf. Zechariah 12-14), it only becomes confusing when we presuppose that a prophet of the sixth century BC is predicting events in the end-times. To reach that strained conclusion, we must assume that Israel and the Church are “two separate people of God.” A Jew coming out of exile in Babylon would not understand such a distinction. In fact, this is an erroneous hermeneutic that arose only in the past 200 years. This way of interpretation has been retrofitted into biblical prophecy through the works of dispensationalist teachers.